If you're not familiar with cocoa butter, you might think we're talking about cooking up some decadent chocolate dessert here, but think again! Though related in a roundabout way to the chocolate we eat, cocoa butter is a natural product that, when applied topically, has many great benefits for your skin. What Is Cocoa Butter, Anyway? 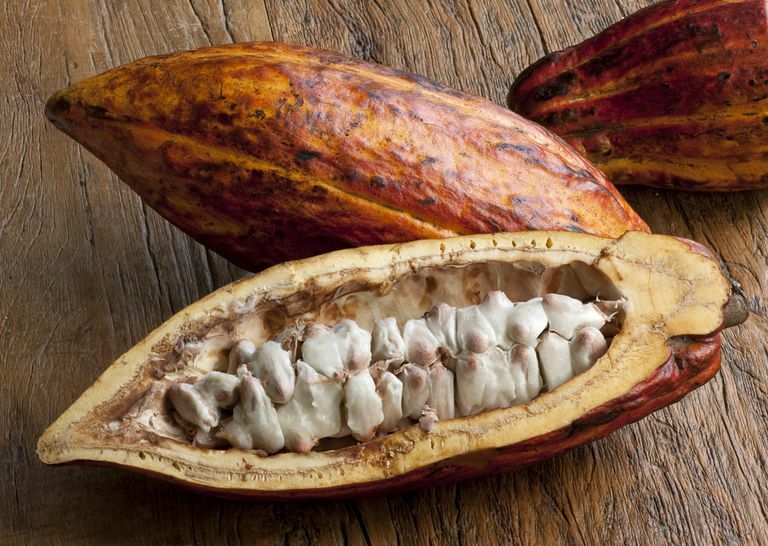 Cocoa butter comes from the cacao (pronounced ka-kow) bean, which is found inside the cocoa pod that grows on the cacao tree. The cocoa pod is a large, gourd-shaped fruit; inside the pod are 30 to 40 cocoa seeds. After these seeds are dried, roasted, and pressed, the vegetable fat is extracted from the beans; you can even do this at home if you want. That fat is what we know as cocoa butter. And yes, this is the same plant that the cocoa powder we all love and eat comes from. Solid at room temperature, it has a low melting point and a long shelf life of two to five years. An antioxidant powerhouse: Cocoa butter is high in antioxidants, which help fight off free-radical damage to the skin. Free radicals can cause skin aging, dark patches, and dull skin. Protecting your skin from free-radical damage is a must if you want to keep it healthy and youthful-looking. Cocoa butter is also anti-inflammatory, which is another way it helps your skin resist the ravages of time. A stretch mark and scar reducer: Many women claim that the regular use of cocoa butter keeps stretch marks at bay during and after pregnancy. These claims are anecdotal, but you'll find many anti-stretch mark cocoa butter products to choose from. In fact, Palmers, a skincare line devoted to cocoa butter, offers a product just for stretch marks. Cocoa butter is also reputed to help heal scars. A deep moisturizer: Cocoa butter is high in fatty acids and hydrates the skin deeply, making it a wonderful addition to body moisturizers and lip balms. It contains oleic, palmitic, and stearic acids, all of which nourish the skin. A sensitive-skin healer: Again, no guarantees, but cocoa butter has been noted to help skin irritations such as eczema and dermatitis. You'll find cocoa butter in two forms: refined or unrefined. Unrefined: Creamy yellow, unrefined cocoa butter is simply cocoa butter in its rawest form. It's easy to find organic, raw, unrefined cocoa butter, and all of the above-mentioned skin care benefits naturally come with the unrefined product. It smells pretty strongly of chocolate, which some people really like. Some cosmetics manufacturers prefer not to use it because it masks the scents of the fragrances they add. Refined: Refining cocoa butter strips away the scent and color, making it easier to incorporate into cosmetic recipes without standing out. Purists claim that processing removes some of the beneficial properties of cocoa butter. Cocoa butter is widely available and inexpensive, in tubs and convenient, easy-to-use sticks. The Cococare Cocoa Butter Stick is a good one to try; it's made of 100% cocoa butter and is very affordable. You can use it on your lips, cuticles, elbows, and all over your skin. You also can buy raw cocoa butter in large batches online if you prefer the DIY route when it comes to your skincare. Aspen Naturals raw cocoa butter is unrefined and perfect for making your own lip balm and lotion. The obvious benefit to making your own is that you know exactly what you're putting on your skin. Cocoa butter melts at skin temperature but is rather hard at lower temperatures; put a piece of cocoa butter in your palm, and it will begin to melt immediately. This is why it makes a great additive to products like lip balm. It helps keep such products thick but melts and moisturizes deeply upon contact with the body. Cocoa body scrub and body butter: The blog Keeper of the Home shares two amazing cocoa butter recipes that will exfoliate and hydrate your skin. DIY body butter: The blog Our Little Green Dot offers a luxurious, heavenly-smelling recipe that combines cocoa butter, coconut oil, and sweet almond oil. Lip balm: Mother Earth Living has a super-easy recipe for make cocoa butter lip balm. Double or triple the recipe to have a stock of lip balms at hand. They make great gifts, too. If you prefer to purchase your skincare products instead of making them, you can find cocoa butter in such products as Vaseline Intensive Care Cocoa Radiant Lotion and The Body Shop Cocoa Butter Lip Care Stick.